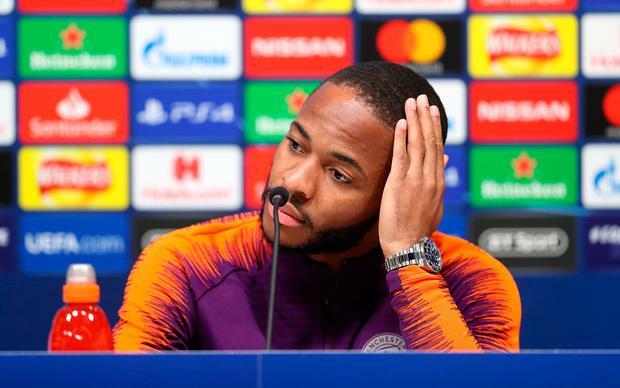 Manchester City's Raheem Sterling during the press conference at Tottenham Hotspur Stadium, London. A spokesperson added: "Once identified, it's vital that, as well as prompting club bans, such behaviour is dealt with severely by the courts. The SPFL wholeheartedly condemns all racism and, whilst rare in Scottish football, it's something we and our clubs take very seriously. We would strongly encourage supporters who witness any kind of discriminatory abuse to report it to the police." Independent.ie Newsdesk Manchester City manager Pep Guardiola has ruled midfielder Kevin De Bruyne out of Wednesday's Manchester derby at Old Trafford.